These days shower doors come in a wide variety of styles and designs. It’s worth putting some thought into finding one that both suits your bathroom needs and looks great. Installing a shower stall enclosure can bring your bathroom up to date in terms of style and functionality. Sliding shower doors are the most common type. They take up the least amount of room and can be fitted above a bathtub where space is at a premium. Because they glide open and shut, bypass sliding doors need tracks to operate. The newest designs have easy-clean tracks that do not trap dirt and sludge the way the older models used to. Some models also bi-pass completely – so you don’t end up with that awkward overlap between panels that is impossible to clean. Framed hinge doors are excellent for creating an elegant look and feel, but they do require enough space to be able to open outward. They are light enough to be safely installed in a fiberglass shower surround and sturdy enough to be used in a bathroom for children or the elderly. 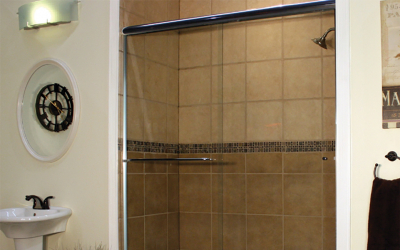 A single action door must open outwards into the bathroom to prevent the user becoming stuck inside the shower enclosure. These models usually come in a few standard heights and are very affordable. The crown jewel of the shower door industry is, of course, the frameless heavy-glass hinge door. These doors are made in three-eighths of an inch or a half-inch clear glass and have very minimal metal. They allow your beautiful tile to be seen rather than hidden and open up the room creating the illusion of space. They are also easier to keep clean than traditional framed models because there is less metal where hard water deposits can build up. For more information contact Valencia Custom Shower Doors at 661-298-0261.